Welcome to Steve's Trax, the UK's leading producer of professional backing tracks for singers, guitarists, bands and tribute acts. Each backing track faithfully recreates the structure and characteristics of the original artist recording, and incorporates a complete (no fade-out) ending. Our online catalogue includes thousands of studio produced tracks, available in MP3 (download), CD or Minidisc format. New productions are added daily and comprehensive lyric sheets are supplied free of charge with every purchase. 1. Please locate your required backing track/s using the search facility to the left or this screen. 2. Listen to a demo and see the track information by clicking on the backing track title. 3. Click the 'add to cart' button to add the backing track to your shopping cart. Click 'continue shopping' to add additional tracks. 4. Once you're happy with your selection/s, click on the 'view cart/checkout' button to review your order and choose your preferred format (MP3, CD or MiniDisc). 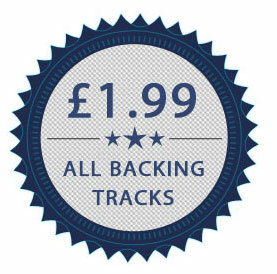 There is no minimum order quantity for tracks required in MP3 format. Key changes: Unless an alternative key is requested, all tracks are supplied in the original artist key. Alternative available keys can be found by clicking on the individual track title. If you require a key change, simply add the track/s to the shopping cart as described above, and let us know your preferred key/s using the 'special instructions' box. This box appears towards the end of the checkout stage. Please type your track title/s and preferred key/s into this box (e.g. 'piano man Ab' etc.) We will then transpose and supply in the available requested key. Please request only those alternative keys that are offered below the specific track title. Quality: We recommend listening to our backing track demo's through a high quality speaker/headphone system to appreciate the dynamic and professional sound of our music. You work hard to make your act successful, and we aim to make this task easier by producing the highest quality backing tracks currently available. All of our tracks are produced with consistent lead-in times and volume levels, and they all conclude with a complete professional ending. Guitar removal: We're able to remove guitars only from tracks which show the information 'guitar removal available'. This information can be found by clicking on the track title. Should you require guitar removal, simply add the track/s to the shopping cart as described above, and type your requirements into the 'special instructions' box which appears towards the end of the checkout facility (e.g. 'american woman no lead guitar' or 'american woman no rhythm guitar' etc). MP3 orders - A download link will be provided for the track/s and lyric sheet/s once the order has been accepted and completed. CD /MiniDisc orders - We always supply on quality branded media (Sony, TDK etc.). Please note: There is a minimum purchase quantity of 5 backing tracks for UK orders supplied on MiniDisc or CD (dispatched via 1st Class Mail). There is a minimum purchase quantity of 10 backing tracks for non-UK orders supplied on MiniDisc or CD (dispatched via Airmail). Useful Info. You'll find links to a variety of excellent articles at the top of the page, covering topics such as singing, music gear etc. plus a few fun trivia pages as well. A copy of our latest backing tracks catalogue can also be downloaded from the 'catalogue' tab at the top of the page, to browse offline at your leisure.